Every Knight has a beginning and the One:12 Collective's Batman starts here. Batman: Ascending Knight is part of a trilogy: A beginning, a middle and an end. The Ascending Knight is Batman in his first year; designed to be contemporary but still have a first appearance feel. The design pays homage to Batman as he first appeared in Detective Comics. The shape of his cowl, the shorter gloves and the smaller symbol on his chest are all inspired by his original debut in the comics. The One:12 Collective Batman: Ascending Knight features: An alternate unmasked head, a One:12 Collective body with over 30 points of articulation featuring hand painted, autentic detailing. 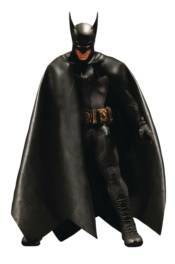 Batman stands over 6' tall and comes with seven interchangable hands and plenty of acessories!